It’s 20 degrees outside on a sunny Saturday afternoon — where do you want to be? Under a blanket reading a book, while your kids play Wii? That seems about right, doesn’t it. When temperatures drop, families stay inside. The lure of the out-of-doors better be pretty good to get kids bundled and families out for a full day of brisk weather. While there are numerous winter sports (skiing, sledding, snowshoeing) to tempt anyone away from a blanket or television set, snowboarding is at a peak in popularity. Just look around any of the area’s resorts and you will see countless skiers; but pay attention and you’ll notice just as many snowboarders. It’s believed the first snowboard was developed in 196 5, when Sherman Poppen made the “Snurfer” (a contraction of the words snow and surf) by bolting two skis together — as a gift for his daughter on Christmas Day. But it wasn’t until the mid-1990s that folks starting seeing snowboarding in a new light, when it was added to the 1998 Winter Olympics in Nagano, Japan. Now, ask any young kid whom Shaun White is … you’ll get an immediate and informed answer. 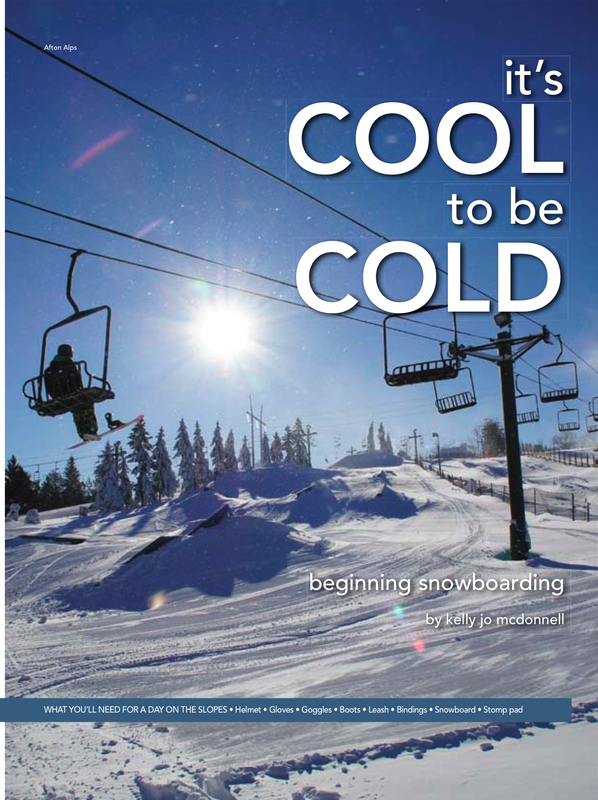 These days, snowboarding is the ultimate cool. And my son, Hayden, even at age eight, is well aware of the sport. While he has enjoyed other winter activities (sledding, tubing), he wanted to learn how to snowboard. This place is super-handy, as families can rent everything they need on site, and have a coach/instructor help along the way. Hoag immediately put Hayden at ease, explaining he was going to set him up with his snowboard and other necessary gear for the day. As we walked to the rental area, we passed the ski shop and Hayden eyeballed the colorful snowboards. I was eyeballing the price tags. A “Ripper” snowboard was on sale for $199.95 instead of $229.95. “It’s on sale!” said Hayden. Hoag steered us away from the shop, explaining that his charge would be starting with a trainer snowboard, which as it turns out is quite a bit heavier than the average snowboard, and much less colorful. &ldqu o;Can you wiggle your toes?” he asked Hayden, as he was putting on his boarding boots. Hoag explained that age eight or nine is a great age to learn skiing or snowboarding. “This year we’ve started a program for younger kids, four and five and six,” he explained, “but the expectations are a little bit different at that age. They don’t have all the fine motor skills.” He added that children of Hayden’s age might have trouble with being “squared up” on the board and not “sitting in the back seat.” He explained that with skiers, the torso, chest, and head primarily face down hill as they ride. For snowboarders, they slide sideways down the hill, so they need to remember to keep the torso and chest parallel to the snowboard and turn just the head to look in the direction of travel. “‘Sitting in the back seat’ is a term used when snowboard riders put more wei ght on their back foot instead of their front/lead foot,” explained Hoag. “It is usually associated with a fear of going down the hill; so new riders will have a tendency to lean backward on their board.” The sooner a new rider can learn to keep slightly more weight on their front foot, the quicker they will progress with their riding. Once my son could get around, he next worked on standing on the board correctly, which initially seemed to be quite a balancing act. Grabbing the rope to go up the test hill was another feat in itself, but he held on for dear life as his coach shadowed him all the way up. Once on the top, Hoag again ran him through the “falling” rules. And it was a good thing, as on the first trip down my son made it halfway, and then fell quite spectacularly. “Good job!” said Hoag, who was right behind him. This went on for about an hour, until Hayden slowly worked his way down the hill without a tumble. He even made it through the “hoop” at the bottom (a hula-hoop type of arc at the bottom that skiers and snowboarders try to pass through). It was about 20 degrees that day, so at the end of the two-hour lesson, we congregated at the Kids Lodge (also known as The Learning Center) to warm up with hot cocoa. Mike Chenoweth (the supervisor and lead clinician), checked in, and he and Hoag discussed how the lesson went. Their enthusiasm for snowboarding and Trollhaugen is infectious, and both are excited about the Learning Center Program. “This is not just for kids,” said Chenoweth, who began snowboarding in 1988. “What we see is too much inactivity. Folks bring their kids out here; they’re enjoying winter. 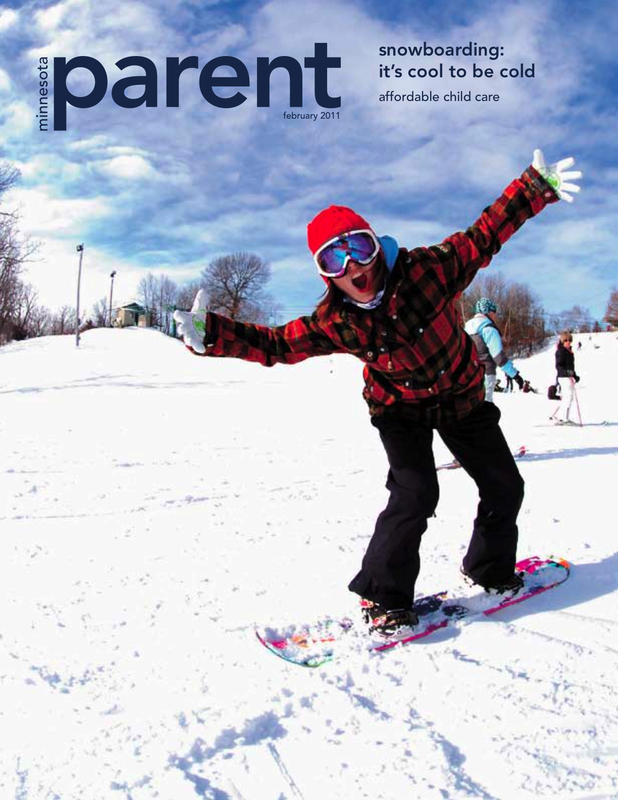 Mom and Dad — let’s enjoy winter with them.” Coach Hoag said that he and the other instructors all want snowboarding to be a sport the whole family can enjoy. My son asked him when he could go down the big hill. “Next time, buddy,” Hoag said. On the way out, we booked Hayden’s next snowboarding lesson. Who knows, the 2020 Olympics aren’t that far away. Kelly Jo McDonnell is a writer based in the Twin Cities. Every slope will have something different, so be sure to check websites or call for more information. 26685 County Road 7 Blvd.